The Occupational Safety and Health Administration issued a memo Thursday weakening workers’ protection against employer retaliation for reporting injuries and illnesses. This is the same recordkeeping regulation that requires some employers to send in their injury and illness logs to OSHA, information that the Obama administration had planned to use for research, targeting inspections and publish on OSHA’s website. OSHA is currently proposing to repeal the second part of that regulation that would require employers to send in more detailed information. The Bureau of Labor Statistics (BLS) reports that around 3.7 million workers are seriously injured in the workplace every year. But the BLS and other researchers have shown wide-spread underreporting of injuries and illnesses — mainly because employers discourage workers from reporting — making the true toll to be two to three times greater—or 7.4 million to 11.1 million. During the comment period leading up to issuance of the 2016 regulation, workers and researchers testified and submitted evidence about how employers discouraged reporting by retaliating against workers for reporting injuries and illnesses. The feared that the regulation would increase such retaliation and called for OSHA to strengthen protections beyond the weak language in Section 11(c) of the Occupational Safety and Health Act. Employer associations like the Chamber of Commerce hated OSHA’s anti-retaliation language and some are particularly upset that OSHA didn’t include repeal of that language in their current attempt to weaken the regulation. Of course, they would never admit to actually wanting to retaliate against workers from reporting, so they focused their opposition on two areas where retaliation was common that OSHA emphasized in the preamble to the regulation: rate-based incentive programs that discourage workers from reporting injuries, and post-injury drug tests that employers often require with the intent of discouraging workers from reporting injuries or illnesses. The memo that OSHA issued did not change the wording of the regulation; it just affected how effectively OSHA inspectors would be able to enforce the language. An employer might enter all employees who have not been injured in the previous year in a drawing to win a prize, or a team of employees might be awarded a bonus if no one from the team is injured over some period of time. Such programs might be well-intentioned efforts by employers to encourage their workers to use safe practices. However, if the programs are not structured carefully, they have the potential to discourage reporting of work-related injuries and illnesses without improving workplace safety. The USW provided many examples of employer incentive policies that could discourage reporting of work-related injuries and illnesses. One employer had a policy that involved periodic prize drawings for items such as a large-screen television; workers who reported an OSHA-recordable injury were excluded from the drawing. The American College of Occupational and Environmental Medicine noted that many of its member physicians reported knowledge of situations where employers discouraged injury and illness reporting through incentive programs predicated on workers remaining “injury free,” leading to peer pressure on employees not to report. A 2012 GAO study found that rate-based incentive programs, which reward workers for achieving low rates of reported injury and illnesses, may discourage reporting. Incentive programs are based on the “blame the worker” theory of accident prevention. That theory states that if only workers would be more careful, there wouldn’t be as many injuries. And offering workers a prize will encourage them to be more careful. Actually, most workplace incidents are caused by unsafe conditions — machines without guards, slippery floors, lack of fall protection, etc. — not worker carelessness. The OSHA regulation didn’t prohibit all incentive programs. Those incentive programs that reward workers, for example, for activities “such as identifying hazards or participating in investigations of injuries, incidents, or “near misses” were perfectly acceptable. Only incentive programs based on injury or illnesses rates were prohibited if they led to underreporting of injuries or illnesses. prohibits taking adverse action against employees simply because they report work-related injuries or illness. Withholding a benefit—such as a cash prize drawing or other substantial award—simply because of a reported injury or illness would likely violate section 1904.35(b)(1)(iv) regardless of whether such an adverse action is taken pursuant to an incentive program. Penalizing an employee simply because the employee reported a work-related injury or illness without regard to the circumstances surrounding the injury or illness is not objectively reasonable and therefore not a legitimate business reason for taking adverse action against the employee. So how is that going to work exactly? A worker suffers a serious cut on his hand while working on an unguarded machine the day before the lottery for a new riding mower ends. Fearing that his co-workers will hate him for causing them to lose a chance for the prize, he sticks his bloody hand in his pocket and heads to the local urgent care to have it sewed up, telling them that he did it while working on his car. Even if OSHA finds out that the incentive program caused the worker to hide the injury, the employer is now home free if there was also a program that rewarded workers for attending safety meetings that identify unsafe conditions in the workplace. When developing the regulation, OSHA also compiled evidence that drug testing had been used by employers to discourage injury and illnesses reporting. For example, drug tests were sometime ordered for injuries that couldn’t have been caused by intoxication, such as musculoskeletal injuries that are “often caused by physical workload, work intensification, and ergonomic problems.” The preamble to the regulation therefore referenced as impermissible drug tests administered “irrespective of any potential role of drug intoxication in the incident” and used to deter proper reporting. In addition, the drug testing had to measure actual impairment, which meant that OSHA would only permit tests for alcohol use, which is the only drug test that can actually measure impairment. Drug testing an employee whose injury could not possibly have been caused by drug use would likely violate section 1904.35(b)(1)(iv). For example, drug testing an employee for reporting a repetitive strain injury would likely not be objectively reasonable because drug use could not have contributed to the injury. And, section 1904.35(b)(1)(iv) prohibits employers from administering a drug test in an unnecessarily punitive manner regardless of whether the employer had a reasonable basis for requiring the test. Employers objected to OSHA’s “intrusion” into their right to drug test employees any time, for any reason. After all, they argued, they should be able to do anything to achieve a drug-free workplace — whether or not employees were using drugs at work or impaired at work, and whether or not the drug testing caused workers to hide their injuries. And some erroneously warned that the anti-retaliation language would conflict with other laws that mandated or allowed drug testing in certain situations. 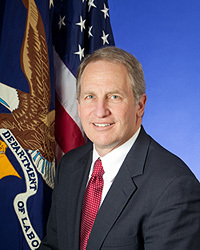 The new policy leaves this policy mostly unchanged on paper — allowing drug testing in the same situations it was allowed before — where required by other laws and permitting it when used “to evaluate the root cause of a workplace incident that harmed or could have harmed employees” as long as all involved employees are tested, and not just those who were injured. But actual enforcement of the language for retaliatory drug testing will inevitably be weakened because the new memo removes language prohibiting drug testing for obviously unrelated injuries or illnesses like musculoskeletal injuries, and removes language prohibiting post-injury drug test except for alcohol. So is an employer home free if they swear that the drug testing was not intended to penalize anyone, but just to “promote safety and health,” (even if it had the effect of discouraging employees from reporting?) We shall see. Will this memo be enough to satisfy employers who don’t like the anti-retaliation language? Unlikely. In response to OSHA’s recent proposal to roll back on section of the recordkeeping rule, several employers submitted testimony calling for repeal of the entire regulation — including the anti-retaliation language. These are Trump Times, after all. It’s the least they can expect. This blog was originally published at Confined Space on October 12, 2018. Reprinted with permission. This entry was posted on Friday, October 12th, 2018 at 12:29 pm. You can follow any responses to this entry through the RSS 2.0 feed. You can leave a response, or trackback from your own site.